Do patients use report cards? What information should report cards contain? How does a provider get good grades? Holistic model for a patient-centered report card. Foundation for Accountability, Reporting Quality Information to Consumers. Portland, Ore Foundation for Accountability1997;9Available at: http://www.facct.org/. Accessed August 27, 2001. Kaiser Family Foundation, Agency for Health Care Research and Quality, National Survey on Americans as Health Care Consumers: An Update on the Role of Quality Information. 2000;Available at: http://www.kff.org/content/2000/3093/. Accessed October 22, 2001. Measuring value (quality and cost) continues to be a major challenge in health care as providers respond to societal pressures (primarily from the payer) to standardize processes and patients assume the role of consumer. Relatively few studies report the extent to which report cards affect patient outcomes of care. Survey results indicate high levels of public distrust in report cards. The information that patients desire often is not what is reported because traditional indicators of quality often serve institutional needs rather than patient needs. Patients understand and value information framed as risk avoidance more so than as an opportunity for better health. Effective report cards are brief and simple. The model surgical report card for patients suggested herein includes ratings for patient satisfaction, functional status and well-being, specific symptom assessment, biologic indicators of disease progress, and costs. Successful report cards strike a balance between quality and cost that meets the needs of the stakeholder for whom they are intended. The decline of the third-party payer system has triggered national scrutiny of clinical practices and outcomes, including the Institute of Medicine (IOM) study1 that focused on the incidence of medical errors and the IOM follow-up study2 that proposed aims and recommendations for correcting systemic flaws in health care delivery.2 This scrutiny has brought about new demands for accountability from the health care industry. Although these demands are, because of the sociopolitical climate, explicitly couched in terms of increased health care delivery quality and decreased patient error, the cost of health care is also a major driver for such reform. Thus, the primary issue in the current health care market is value of services, which is a function of quality and cost; in reality, all of the major stakeholders should be concerned about the synergistic relationship between these 2 entities. As efficiency and quality of care increase and costs decrease, the value of delivery increases. Concentrating solely on improving quality, as many providers would like, does not necessarily improve the value of care provision; if costs are not controlled, by gaining process efficiencies, service value may actually diminish. Demands for value accountability stem from all major stakeholders, including providers (hospitals and professionals), insurers, patients, and, especially, employers (federal and private). As health care enters a market economy, patients are increasingly adopting the role of consumer. As this evolution occurs, the value of services increasingly becomes the major driver of the health care market; as noted previously, quality and cost are inherently linked and simply cannot be evaluated in isolation. With this change in role, new questions arise that health care service providers must address: What do consumers of medical services want to know about service quality? How can this information be assembled and effectively communicated to the public? How can consumer needs and preferences be most effectively accommodated? Data about the costs of care are readily available to consumers as a basis for comparing health care plans. However, because competitive hospitals and provider organizations are sometimes known to reduce costs at the expense of quality,3 cost data alone are not adequate decision-making tools for selecting quality care. Rather, alternative tools are necessary that provide meaningful information relevant to the consumer's expectations of service value. The health care system should make information available to patients and their families that allows them to make informed decisions when selecting a health plan, hospital, or clinical practice, or choosing among alternative treatments. This should include information describing the system's performance on safety, evidence-based practice, and patient satisfaction. Increasingly, consumers want to know how well providers and hospitals perform so that they can make a decision about where to obtain care. In addition, hospitals and providers need to know how well they are performing and where they need to improve. Clearly, valid reports are potentially valuable to all stakeholders. Good grades translate into improved health outcomes for patients, lower health care costs for payers, and a valuable marketing asset for providers and hospitals. Underlying the effectiveness of all report cards is an understanding of the term "quality," especially as it relates to value. A single definition of quality is elusive because quality depends on a variety of factors: (1) the variables selected for measure and (2) individual experience and frame of reference. In 1990, the IOM5 defined quality as the "degree to which health services for individuals and populations increase the likelihood of desired health outcomes and are consistent with the current professional knowledge." Donabedian6 viewed quality in health care in terms of 2 interdependent components: technical and interpersonal. Health care providers must interact with patients to learn the nature of their medical condition, their needs, and their wants. This interaction is vital to achieving high technical quality. Technical quality can be judged by comparison with practices that are known to produce the greatest improvement or benefit for specific conditions. In contrast, interpersonal service quality is far more difficult to evaluate and report because it can depend on a plethora of individual and societal expectations. Because patients cannot routinely evaluate the technical components of care, they usually concentrate on the nature of interpersonal service quality. Measures of the technical and interpersonal components of quality can be taken from 3 categories of information that relate to patient care: structure, process, and outcomes.6 Structure denotes the characteristics of the setting in which care is provided (eg, the number and qualifications of staff, the presence of multidisciplinary planning teams, and the design of the operating room). Process refers to the activities performed in giving and receiving care, including provider and patient activities (eg, how clinical teams function). Outcomes are the results of care and include clinical results, patient satisfaction, and financial variables, such as cost. Since World War II, standardization of processes within service industries in the United States has become commonplace. This standardization is similar to that which manufacturing underwent during the Industrial Revolution of the 19th century. In particular, high-risk services such as air travel have been the focus of study and regulation in recent decades. Now, as health care rapidly becomes the largest service market economy, these same types of expectations for objective measures of service quality, consumer safety, and cost efficiency are being applied to patient care. Although the standardization of processes in US health care began to gain momentum only with the advent of managed care in the 1970s, the history of health care performance measurement extends back as far as the middle of the 19th century in the medical literature. During the Crimean War, Florence Nightingale7 initiated the practice of collecting data about medical interventions in hospitals and their corresponding outcomes. For the next 100 years, although hospitals continued to collect performance data, these data were not available to the public. In the United States in 1987, this changed when the media, by means of the Open Records Act, accessed and made public Health Care Financing Administration data on hospital mortality rates. These early report cards were limited to data extracted from administrative claims files on mortality, length of hospital stay, and readmissions—performance measures that were designed to meet the information needs of providers and hospitals. These reports did not address issues related to patient health status, satisfaction, or functional ability. As public awareness grew regarding the release of health care quality data, report cards evolved to meet employers' needs in evaluating health care plans. In 1989, a group of employers initiated a movement to identify standardized performance indicators for health care providers. This movement led to development of the Health Plan Employer Data and Information Set,8 which originally included data that focused on process indicators (activities that providers perform) and structural indicators (resources or organizational characteristics in place for care provision); lacking was information about the outcomes of care. To address this knowledge gap, some of these same employers partnered with the Health Care Financing Administration to form the Foundation for Accountability,9 which creates tools that help people understand and use quality measures, develops consumer-focused quality measures, supports public education about health care quality, and promotes efforts to gather and provide quality information to the public. The high interest of employers in performance data has continued into the 21st century, as evidenced by the formation of the Leapfrog Group,10 a coalition of Fortune 500 companies and other large private and public health care purchasers whose published goal is to initiate breakthroughs in the safety and quality of health care in the United States. Their plan to effect radical health care quality change is to create and commit to a common set of health plan purchasing principles intended to improve patient safety and the quality of care provision. However, with heath care benefits occupying an ever-increasing percentage of corporate expenses, cost issues may be the true underlying concern of private industry's recent interest in this arena. Via a massive critique of the nation's hospitals, the group identified an initial set of 3 process indicators important for reducing costly medical errors: computerized physician order entry, intensivist physician staffing in intensive care units of hospitals, and evidence-based hospital referral (relying on measures such as the volume of procedures performed). Unlike the Foundation for Accountability, which uses outcomes of care as performance indicators, the Leapfrog Group has been criticized by hospital organizations for relying heavily on characteristics of the processes in care provision. Such criticism is well founded. For example, a recent IOM report11 warns that volume may be only a good "proxy measure" for outcome and that the processes used at high-volume facilities, clinical pathways, and organizational procedures, rather than high volume alone, more likely explain the improved outcomes. The IOM recommends additional research into these processes as indicators of outcomes rather than indirect indicators of quality, such as hospital volume. The fact that performance data such as these are seemingly not valued by consumers raises some interesting questions about the content and form of present-day report cards and their accessibility. The underlying issue seems to be one of trust. First, because report cards initially evolved from tools used by hospitals, providers, and employers to measure health care costs, a residual level of distrust of health care statistics can be assumed to remain in the mind of the public. Second, access to public data via the Internet likewise raises questions related to the methods used to score and rank health care service providers. For example, the hospital report cards produced by U.S. News & World Report and HealthGrades.com rely on publicly available claims data from Medicare. The clinical outcomes and costs data on which these ratings are based come from patients older than 65 years and do not reflect care across the continuum of life. A survey of patient responses to these quality reports found that 65% of patients distrusted the information, and only 4% used report card information to make health care decisions. Their other primary reason for not using quality information was the lack of information related to their specific condition.18 A group from the automobile industry and associated labor organizations concerned about the lack of patient information in such reports commissioned the Hospital Profiling Project in 5 major metropolitan areas. The Hospital Profiling Project provides similar ratings of hospital quality but uses patient satisfaction information as 1 of its 3 primary criteria for evaluating hospital quality. Currently, there is no clear agreement about which indicators to include in report cards. Furthermore, the availability, validity, and reliability of currently used indicators often have not been demonstrated, and not all commonly used indicators for report cards are related to the quality of care provided.19 Information for report cards is derived from 2 sources: (1) primary data collected directly from the patient and (2) secondary data traditionally extracted from financial systems or medical record audits. Clinical data from claims systems are limited to cost data and crude outcome measures (ie, mortality and morbidity rates). Although claims data are readily available, inexpensive, and easy to analyze using computer programs, the integrity of the data is questionable. Improper coding by physicians, transcription errors by medical records personnel, and the failure of the coding system to capture comorbidities are among the potential causes of data errors. Consumers want understandable information that is meaningful, timely, and trustworthy. However, some researchers20 question whether report cards should contain the content that consumers say they desire vs the content experts believe consumers should be provided. Typically, patients want to know about results as opposed to processes or products.21 Therefore, what patients desire is often inconsistent with what experts have traditionally included in report cards. Patients understand and value information framed as risk avoidance (eg, the probability of medical error) more so than information framed positively as an opportunity for better health. They also want the information to be brief and concise.22 No relationship was found in a study23 comparing patient definitions of quality with traditional provider-defined indicators of quality (eg, medication error rate, nosocomial infection rate, fall rate, acuity, and volume). Patients expressed more interest in interpersonal process indicators, for example, to be treated as a unique individual by a caring, attentive, and competent professional who involves them in care decisions.22 In other words, patients were more interested in service interaction quality, the inference being that often-used traditional indicators of quality serve institutional needs more so than patient needs because patients cannot adequately evaluate the technical aspects of care delivery. A recent report2 about the quality dilemma in health care in the United States challenged the health care system to make information about the performance of hospitals, health plans, and clinicians transparent to patients. Consumers of report card information should be able to easily understand what is reported and how the information was obtained. To increase patient use of report cards, providers must frame information in a manner that captures patient attention. Based on studies23,24 of patient information desires, a surgical report card for patient use would ideally contain 2 types of information: (1) the rate of adverse outcomes and (2) the interpersonal aspect of care. For example, if approached from the risk-avoidance perspective, functional status on a report card should be framed as avoiding loss of function rather than as a return to pre-illness function. This perspective may be explained by the frequent assumption made by patients that they will return to their normal functional level (ie, before disease onset). Why patients are most concerned about the risk of adverse outcomes is unclear. One could surmise that providers have not communicated the positive outcomes that patients should expect, and thus they make decisions based on what is most frequently communicated, namely, adverse events. 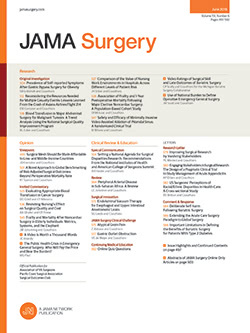 A report card for surgical patients should be brief and should supply meaningful information about the outcomes and costs of care using indicators that are appropriate to surgical interventions.24 Condition-specific outcomes are of particular importance for surgical patients because many surgical interventions are intended for relief of symptoms related to a specific problem. Functional, physical, and physiologic outcomes are specific to conditions, whereas social and psychological outcomes are more generic and global in nature. In addition, service quality is a major factor of interest to patients. Service quality is affected by many factors, including the setting of care, the multitude of providers participating in patient care, and the individual characteristics of the patient. An important component of service quality is patient satisfaction with interpersonal care. Patients want to be treated as unique individuals by a caring, attentive, and competent professional who involves them in care decisions.23 A holistic model for a surgical report card for patients is presented in Figure 1. The current emphasis on quality report cards for patients demands a better understanding of the link between the process of care and the outcomes of care. Specifically, hospitals and providers need information about which critical processes and structural components produce good outcomes. For example, do multidisciplinary discharge planning conferences affect postoperative return to normal function? Clinical process improvement and service quality analyses must involve all disciplines involved in the care delivery process. Health care systems that truly perform clinical process improvement understand the inherent link between quality and cost; they focus on the value of the delivery system. This type of process involves both professional caregivers and administrators examining in a collegial, systematic manner several variables regarding the provision of care. Such variables include quality of care measures (including medical errors), process efficiency concerns, employee and patient satisfaction issues, and financial indicators. In this fashion, all of the stakeholders eventually appreciate that all of these variables include value and are inherently synergistic. Although, traditionally, most health care professionals respond primarily to quality of care issues and it is perceived that administrators are interested primarily in financial variables, the reality is that both sets of stakeholders will need to appreciate the interaction between both sets of variables. Clinical process improvement is a formalized process for such an endeavor. Collecting and analyzing quality data for report cards is expensive and requires trained personnel. Currently, patient outcome evaluation occurs external to the care provision process and is performed as a part of outcome studies. Various instruments are used to measure symptom management, functional status, and health status and health-related quality of life, and no standard has been agreed on (Table 2).25 These measures are used most frequently within the context of clinical research. Ideally, measurement systems should be built into the care delivery process.42 As clinical information systems become more prevalent, the opportunity for directly collecting more detailed clinical information, including symptom management and health status indicators, will eventually become a reality. Relevant information will be more precise and timely and, therefore, could be used to adjust the clinical care processes as care is provided. Advances in computer technology will reduce the burden of data collection for the patient and provider and will afford greater opportunities to evaluate patient outcomes after surgery from their homes. Just as clinicians insisted on severity adjustment when mortality rate was the indicator of quality, future outcome measures of functional and health status must be sensitive to differences in patient health characteristics to accurately compare patient outcomes. One solution would be to model functional and health status measures after some types of entrance and licensure examinations that individualize the questions based on the responses to previous questions.43 Using such a measurement process could more accurately pinpoint the true functional and health status of an individual before and after surgery. Subsequently, the measure for comparison would no longer be a standard yardstick but rather the amount of change in critical indicators of quality, such as symptom management and functional status. The current revolution in surgical processes using minimally invasive techniques is only the beginning of the changes that technology will engender. Telesurgery, robotics, and telemonitoring are on the horizon. As clinical information systems become more prevalent and telemonitoring technology develops, it may be possible to measure an individual's outcome against his or her own metrics, thus individualizing quality for that person. These changes will require revisiting quality report cards. The aging population also poses new challenges for report card development. As people age, they become more complex in their physical and psychological makeup and, therefore, more variable in their responses to the same interventions. The need for valid and reliable instruments that measure the technical and interpersonal aspects of quality will require increased levels of sophistication.23 Report cards will be increasingly necessary to compete in the health care marketplace; they will be tailored to specific stakeholders. For example, patient report cards might be centered on interaction and clinical outcome measures, whereas institutional, payer, and provider report cards would include a larger degree of various financial measures. Each successful report card will ultimately strike a balance between quality and cost, or service value, that is most important to the requesting stakeholder constituency. The combination of a market economy, increasing technology, and increasing costs in the health care sector will continue to drive the development of a benchmark for service provision; the report card is the prevalent term for such an entity. Corresponding author and reprints: Richard W. Schwartz, MD, MBA, Clinical Operations, Lexington Veterans Affairs Medical Center, 2250 Leestown Rd (118 CDD), Lexington, KY 40511-1093 (e-mail: rschw01@pop.uky.edu).